Hot off the presses is news that French brand L’Occitane is launching a makeup collection in Europe in May 2010. How very fascinating! 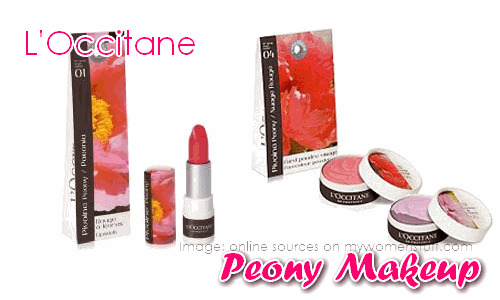 The theme of the collection is centered around the Peony flower as the products contain Peony extracts. The makeup products will be skin friendly, and contain no parabens, so the news say. Images show lipsticks and face colour powder duos. The latter can be used on your face and eyes. The packaging is cardboard and there is something vaguely familiar about the whole line. I cannot quite put my finger on it yet. The cardboard packaging reminds me of Stila but there is something about the whole line that is haunting me. No news yet about its launch in the rest of the world. Beaut.ie has announced that it debuts in Ireland on May 4th. Swedish blog Bjooti.net has some product pictures pre launch but The Muse is still wondering if it will appear on USA shores. PREVIOUS POST: What will you miss from Shu Uemura? Cardboard packaging? sounds a lot like paul & joe! Everything looks so pretty! I hope it will be available here too. And I agree with Kahani, the line reminds me of Korres too. the cardboard packaging reminds me a little of paul & joe actually! hmmmm the packaging to me, kinda looks like lavera organic cosmetics. With the large flower picture and also cardboard packaging too. I think that brand’s slipped under my radar. I’ve seen the sunscreen but not the cosmetics here. I agree with the others that said Paul & Joe. The second I saw the picture and read the word “cardboard” that’s what I thought. I like the look of the face powder. Hope I can see it in person sometime, since I’ve been fooled by online pictures too many times before, hehe. Same! Its best to see it in person to see if we like it before we commit. I purchased several items from this line and was, unfortunately, largely disappointed. The tinted water is barely pigmented at all (I have very fair skin, so for something to not show up on my skin is a feat) and has a bizarre metallic sheen when used on the lips. The glosses do not last long and the peony scent gives me an itch in my throat. The face color powders are nice, but once again, not heavily pigmented. I love l’occitane, but I’m going to have to say, stick with their skincare products! sadly the glosses and lipcolors look great but they do not last and i found the lipgloss a bit sticky..the lipsticks are very sheer and color fades rather quickly..lovely packaging though!